CORPUS CHRISTI, TX - Well-Worn Walter is a little frayed along the edges. 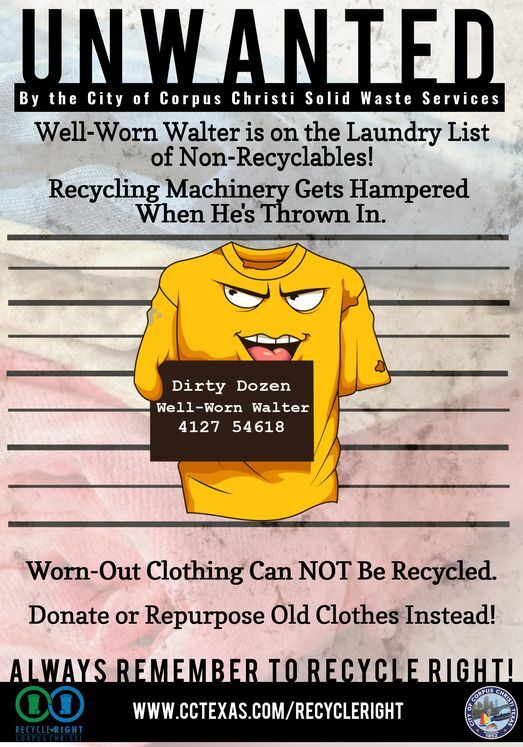 Also known as old clothing, the latest character in Solid Waste Services' Recycle Right campaign reminds us why old clothes do not belong in the blue recycling bin. Clothes jam up the recycling center’s sorting machines and get tangled up with good recyclables when placed in the blue bin. Used or unwanted clothing should be donated to charity or sold back to thrift or resale shops. It can also be repurposed for craft projects or as reusable cleaning rags. Old clothing items should never be placed in the blue recycling bin. The City’s Recycle Right campaign is designed to inform and educate the public about how and what to recycle. More recycling information is available at cctexas.com/recycleright.